Stainless steel hex cap screws are also commonly known as stainless hex bolts. High quality, grade 18.8 stainless steel cap screws/bolts with coarse (USS) thread. 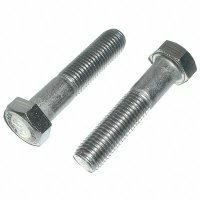 Stainless steel head cap screw and bolt pictures are a general representation and not an actual picture of the product you will receive. Threads will vary according to the individual bolt sizes and dimensions. ISO standards for threads are: length is twice the diameter of the bolt plus ½ inch. If you are looking for fully threaded bolts please call direct at 800-872-5557.